Preheat the oven to 400°F (200°C). Cut the top of the garlic head, exposing the garlic cloves, and place it in the middle of aluminum foil cut side up. Drizzle 1 tablespoon of olive oil and wrap the garlic. Roast for 45-75 minutes, or until the garlic is golden and soft. Start checking it after 45 minutes, at this point it should be ready, but for more color and flavor, continue to roast for another half hour. On a floured surface, roll the dough into 10x12-in (25x30cm) rectangle. Spread the garlic-olive oil all over the dough. 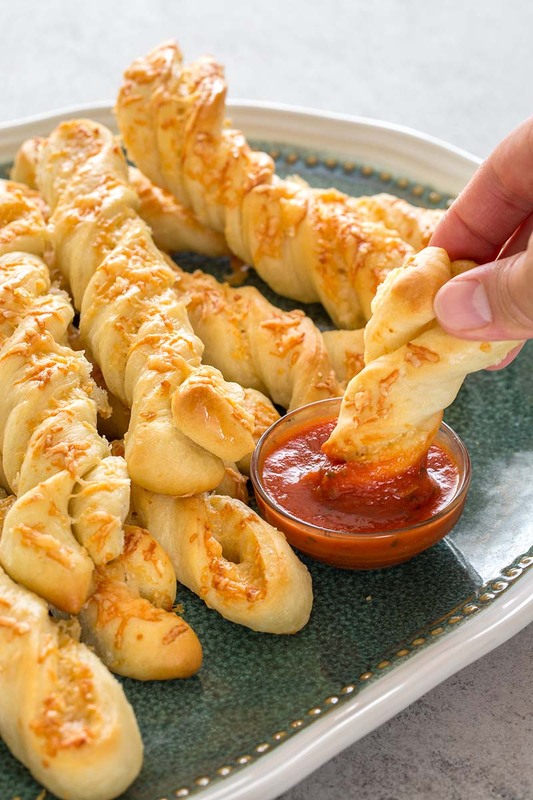 Sprinkle about half of mozzarella and Parmesan cheeses over dough. Twist each strip and arrange them on a baking sheet lined with a silicone mat or parchment paper.